Let’s start with lunch (after a serious bingeing session on Simee Market’s delicious fares earlier! ), at this inconspicuously low profile eatery named Sun Kam Wan in Ipoh Garden; yet this particular stall serves possibly one of the BEST version when it comes to braised chicken in soy sauce, and various other braised dishes. Get your napkin ready, and here we go ….. In his elements here; this affable guy has been running this stall for years now. He was from Bercham; if you’ve been an ardent follower of his, then you would know. Somehow, I find it so easy to write about food from Ipoh. Effortlessly, if you will. Maybe it’s due to the fact that I have been growing up with some of the places that I have reviewed. Or the fact that searching for good food in and around town has never been tedious. I can remember almost every shop located at every nook and corner of Ipoh at the back of my mind. Seriously, after more than two decades of life spent in this charming town (to me, Ipoh is still my beloved homeTOWN) exuding a warm aura of homeliness and belonging, it’s slightly disheartening to see the younger generations (I’m an aged specimen, so don’t group me together …) opting instead for the swanky bistros/cafes/’char chan teng’ …. shunning the ‘low jiu pai’ (classics) in the process. You don’t see teenagers nowadays meet up and chat over coffee at Sin Yoon Loong, lunch of a hearty meal at Concubine Lane, or even vague recollections of Cowan Street being the origin of the ‘nga choy gai’ mania, not the commercialized Lou Wong. Sumptuous soy sauce chicken lightly garnished with Chinese coriander, and a block or two of the velvety smooth beancurd in the background. Call me old school, but braised chicken in the sweetish soy sauce with a herbal tinge beats roast chicken anyday. Maybe owing to this peculiar trait of mine; perpetually vouching for the old school eateries, traditional restaurants, and taste from the yesteryear’s, that I have constantly surprise many strangers over the fact that I am NOT a grumpy old dude in his late 50’s. Or even older, but to be eating in such reckless fashions at 60’s doesn’t sound believable, hence 50’s wouldn’t be stretching the imagination too far? I have even met people whom have had this misconception that I am a full time writer, since I used to write at breakneck speed, it was almost impossible to imagine from where I managed to attain the energy, time and effort to do so. Though not as plump as the ones served in dedicated Bean Sprouts Chicken outlets, you can’t actually fault Ipoh’s most famous vegetation. Anyway, it’s been a good 3 years since I started writing on Motormouth From Ipoh. Not an incredible feat, as we have plenty of food blogs with life span longer than you and I could imagine. I probably will bore you to death if I continue harping on the ‘legacy’ (or lack thereof) of this personal space of mine. So let’s leave the rants for another day. 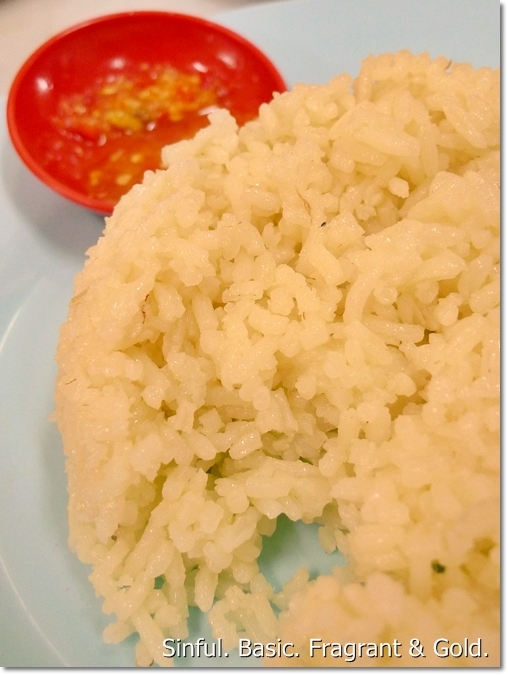 Gorgeously golden oil rice with a plate of piquant chili sauce as condiment. 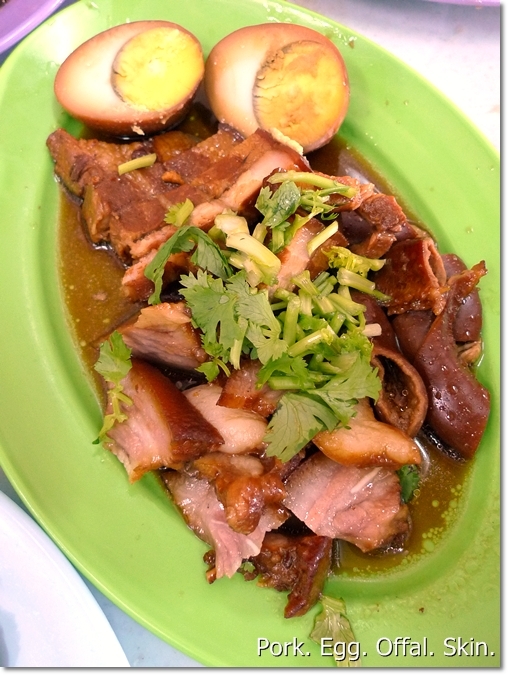 Additional plate of braised pork, egg, the pig’s skin and the intestines. Sun Kam Wan is this restaurant (more of your neighbourhood coffee shop) in Ipoh Garden, situated a few doors away from the famous Sun Marpoh (one of the BEST Chinese diner in Ipoh, period) and KFC/Maybank near to the Ipoh Garden roundabout. The same row of shops also houses two vegetarian restaurants; namely Sin Meng Kee and Su Sum. I have been itching to write about this stall; serving what could be the most basic of dishes to go with your rice; soy sauce chicken, braised pork/egg/offal and several vegetable dishes to complete your meal. Only opened for breakfast-late lunch, you will see this place swarmed during lunch hours; usually a line of people queuing up to take away the reasonably-priced fares to be consumed within the comfort (seriously?!) of their office or home. But to be able to whip up such pleasantly delightful braised chicken (about 8 or so chickens on display, and finishing fast, so don’t go after 2pm) is a mastery of sorts. My grandma was and still is an ardent fan of this; and I have been converted into one by Mum a few years ago. Good coffee and tea at the same restaurant too, so don’t count them out. For RM19/USD6, you can get a satisfying meal for three here. All of the dishes above inclusive (except the drinks, of course). 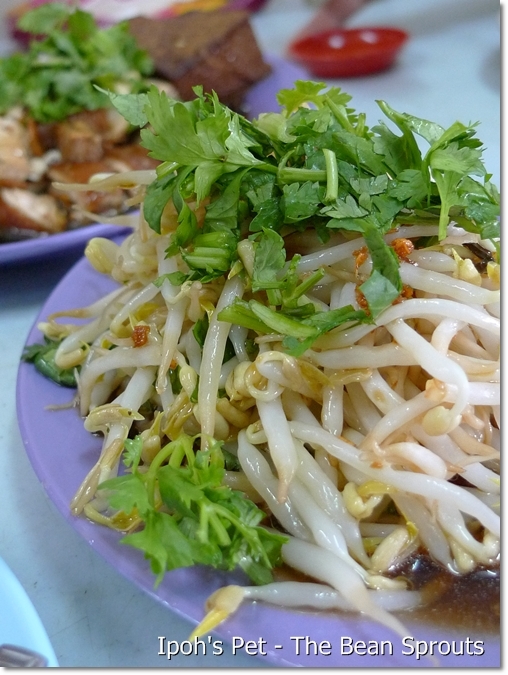 And no, this may not be rocket science, nor molecular gastronomy …..
Ipoh Garden, 31400 Ipoh, Perak, Malaysia. Closed on a consecutive Tuesday and Wednesday middle of the month. Opens from morning until late afternoon daily. Yeah!!! WHere in Kampar? You need to point me in the right direction. Been some time since the out of Ipoh excursions. Maybe I shall do Taiping end of this month. Or next weekend. Hey motormouth, or whatever your name is ,you seem to be working in KL but then you are here there and everywhere. In Ipoh for work during the weekend? Then going to Taiping? I am confused!Are you a medical rep and qualified pharmacist? Uhh… you know the flats around KTAR? There’s a row of shops behind the flats. The shop’s name is Sun Yong Kee if not mistaken. Hehe. 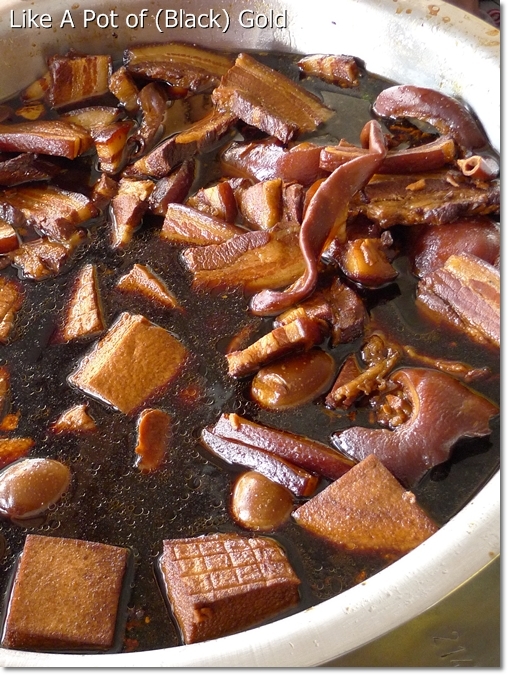 So this is the fabled ipoh ngah choy kai? How’s the texture? bak shuet shuet, what luit luit? Hey Freddie. The fabled Ipoh nga choy gai is NOT this one. 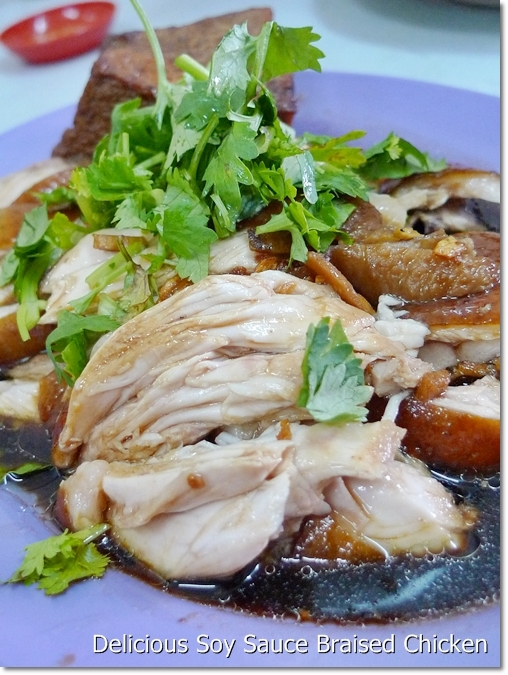 This one serves soy sauce chicken only, no poached chicken (pak cham gai). this reminds me of the old skool melt-in-ur-mouth braised meats and chicken. Nice. Not many places serve good braised dishes anymore. Yeah …. you know, back then there used to be this very nice stall at Macy in Ipoh Garden East (the shop next to the overhead highway) that sells an even more amazing variety of braised dishes at night. So good that we used to take away the dishes at least once a week. Then the stall closed down and no trace of that ever since. Low chee tau pei. The best. Yes. As homely as they can get. I’m bound to do a revisit, but then again …. just too packed this time around. Maybe next month? Congrats on your 3rd anniversary motorman. Good one to wake me up in the morning when I am just planning to have a cup of coffee. I just look at the pictures and get fat..
BTW, have you written about that famous kopi shop in downtown Ipoh with the best white coffee and sponge egg cake which is almost always sold out the minute they take it out from the oven. I always go straight to that when I am in Ipoh. You mean old town in Ipoh? Yeah, Sin Yoon Loong white coffee. You can even find the link to that post in this very post. 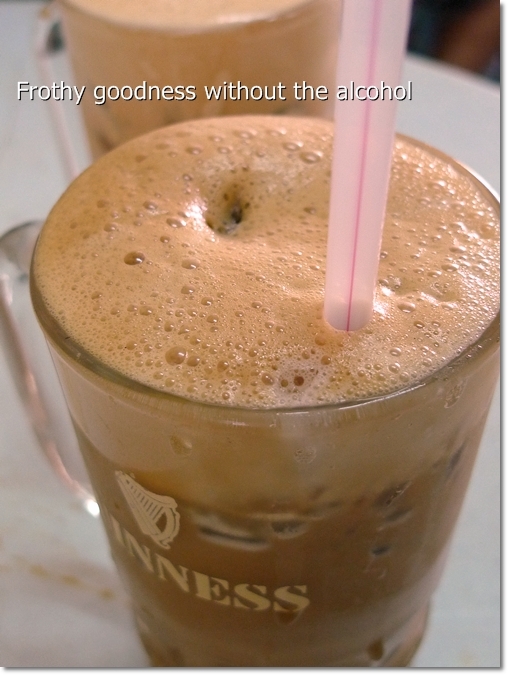 Good ‘kai dan gou’ with white coffee, though the brew has been on the deteriorating end lately. If u mean the one opposite the market, yes there are still there. the har mee is becoming more and more expensive. i love the kung po tin kai by a stall inside the coffee shop. Oh … Jln Laxamana right? I think this same stall serves frog porridge or something. yup that’s the one. u can order frog porridge or just plain porridge. the frog can be cooked in black sauce with dried chilli (kung po). i really love the sauce that’s why i’ll order plain porridge to go with the kung po sauce. That’s how Geylang frog porridge came about anyway, you can have the frogs in the porridge or cooked in the other methods; especially the kung pao. He was from Bercham in fact. Now his brother (I think) is running that stall there. Haha … stay SLIM?!! Are you sure….. ahem. 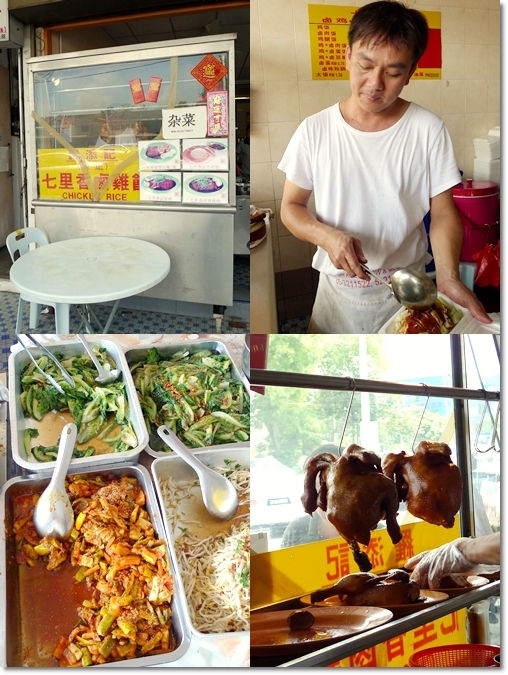 Anyway, awaiting your plan on Fu Kua ..
wonderful ‘chicken’ rice this guy sells. yummy…..
Haha… now that’s a sin to share? Funny now only I have to time to write about it, already miles away from Ipoh.